(Okatie, S.C.) For the students enrolled in Heather Rembold's environmental science class at John Paul II Catholic School, the opportunity to get outdoors on a sunny day in April is a big deal by itself, but the group was also excited for the chance to get their hands dirty (and their boots muddy) assisting scientists from the S.C. Department of Natural Resources assemble an artificial oyster reef along the banks of the Chechessee River at the Port Royal Sound Maritime Center. "Today we are going to be building an oyster reef using these modified crab traps," said DNR biologist Ben Stone, a member of the DNR Marine Resources Division's Shellfish Research Section. "The primary goal of this study is to test a new 'living shoreline' structure that could potentially be used by private property owners." 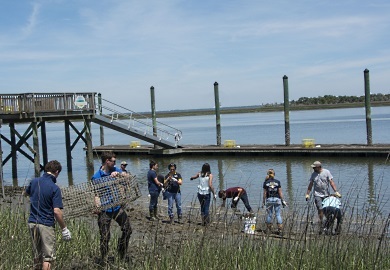 The pilot study, funded by the S.C. Sea Grant Consortium and the Lowcountry Institute, is designed to see how well the mesh material used in commercial crab traps works as a base for creating "living shorelines" based upon the development of oyster reefs, added Stone. Living shoreline approaches are being investigated because, unlike hardened structures such as bulkheads or seawalls, they have the potential to harness the power of sand, spartina grass, and growing oysters to help stabilize shorelines naturally. In addition, living shorelines work to help improve water quality via filtration of upland run-off and create habitat for aquatic and terrestrial species. Oyster reefs filter large volumes of water, help stabilize salt marsh fringing shorelines, and provide essential habitat for many species of finfish and invertebrates such as crab and shrimp. 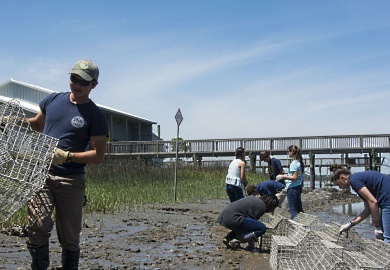 DNR scientists involved in the project are hopeful that living shorelines can help coastal property owners in South Carolina fight erosion caused by high tides and boat wakes. Living shorelines in other states on the Atlantic coast have been shown to offer greater resilience to coastal shorelines than vertical engineered structures which separate land and water processes and prevent the marsh habitat from being able to migrate landwards in the event that sea level rises. The DNR is also working with DHEC and other permitting agencies to improve the permitting process for these types of reefs, which should also help coastal property owners in South Carolina over the long run, added Stone. "Until recently DHEC (the S.C. Department of Health and Environmental Control) could only issue a permit for traditional erosion control structures, such as bulkheads, once the high ground starts eroding," said Peter Kingsley-Smith, the DNR biologist in charge of the work. "In a limited capacity, however, DHEC has permitted oyster-based approaches to address erosion issues more pre-emptively to prevent the subsequent loss of high ground and is working closely with DNR to support living shorelines as a more preventative approach." 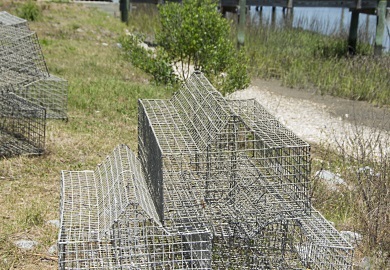 Recycled mesh wire crab traps dipped in concrete to provide a shell-like surface for oyster larva (called "spat") to attach to have been used previously at other locations, though the "traps" used to create the reef at the Maritime Center site were purpose-built (by Beaufort Marine Supply) and have a slightly different profile than a conventional crab trap, which is usually about a 2-by-2 foot square box, said Stone. The lower profile of the engineered traps makes the permitting process for them easier because the reefs don't stick out of the water so far, making them less of a navigation hazard, and the increased surface area should promote better oyster recruitment and growth. Furthermore, the pre-fabricated structures are not reliant on donated or recovered derelict traps and could therefore be deployed at a higher rate and on a larger footprint. Numerous types of materials can be used to create new oyster reefs, including both loose and bagged recycled oyster shells, and "oyster castles," building blocks developed by Allied Concrete, Inc., based in Charlottesville, VA. In fact, reefs made of bagged shell produced by the DNR's S.C.O.R.E project (http://score.dnr.sc.gov/), upcycled derelict crab traps coated in concrete, and the castle blocks were installed at the Port Royal Sound Maritime Center by volunteers working with DNR as part of large public education event in May of 2015, funded in part through a NOAA NERR (National Estuarine Research Reserve) Science Collaborative grant. The John Paul II environmental science students are also engaged in monitoring these structures to collect data that DNR scientists can use to determine which reef materials work best at different locations. That's a terrific experience for them, said Diane Reilly, who stopped by the build site for a few minutes on her lunch hour to watch. Reilly's daughter Megan was among the students installing the latest living shoreline at this site, and she was impressed by the "real-world" experience that volunteering for the project affords the students. Over time, the data collected by the students and by DNR scientists will help the agency gauge the effectiveness of different reef structures at different locations. Other study locations near the DNR's Bennett's Point Field Station in the ACE Basin and at other locations on the South Carolina coast are planned. Long-term monitoring of the sites will focus on how much sediment builds up behind the structures over time and whether new growth of Spartina grass and other plants indicate that the marsh edge is stabilizing and even expanding. That, along with the growth of oysters on the structures, will tell scientists how well they are working enabling DHEC to potentially develop new living shoreline regulations based on the best available science to support citizens interested in pursuing living shoreline-based approaches to address erosion issues on their properties.